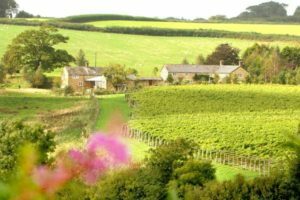 Furleigh Estate is 85 acres of vineyard, lakes and grazing land surrounded by woodland. The area is teeming with wildlife; buzzards fly overhead; deer, pheasants and partridge roam the vineyard, while heron fish regularly from the lakes to which our resident geese return each Spring. Furleigh Estate donate 10p from every bottle sold of their “Tyrannosaurus Red” wine to the Jurassic Coast Trust. They also host Jurassic Coast-themed evenings as part of the partnership. Check our Events page for any upcoming evenings.